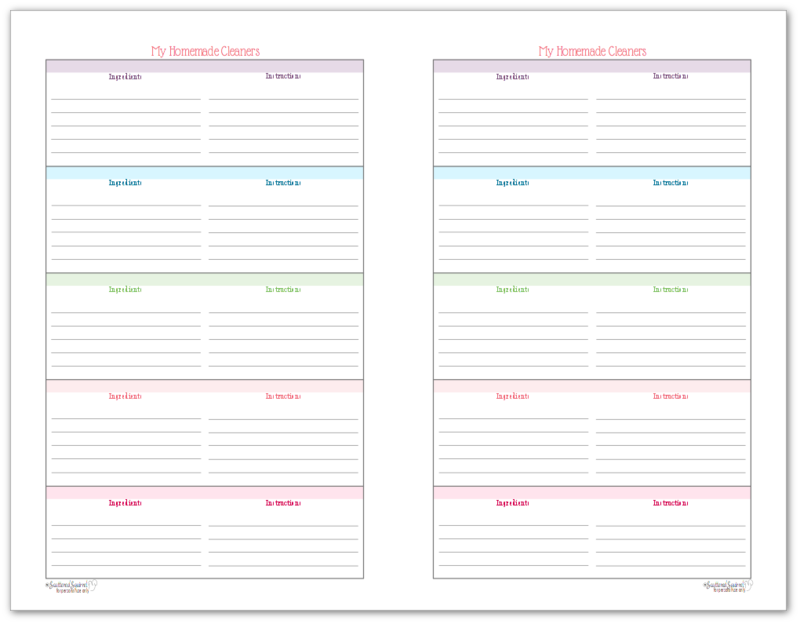 Today I’m last few cleaning printables that round out the cleaning section of my home management binder. This section is one of the most used sections in my system. 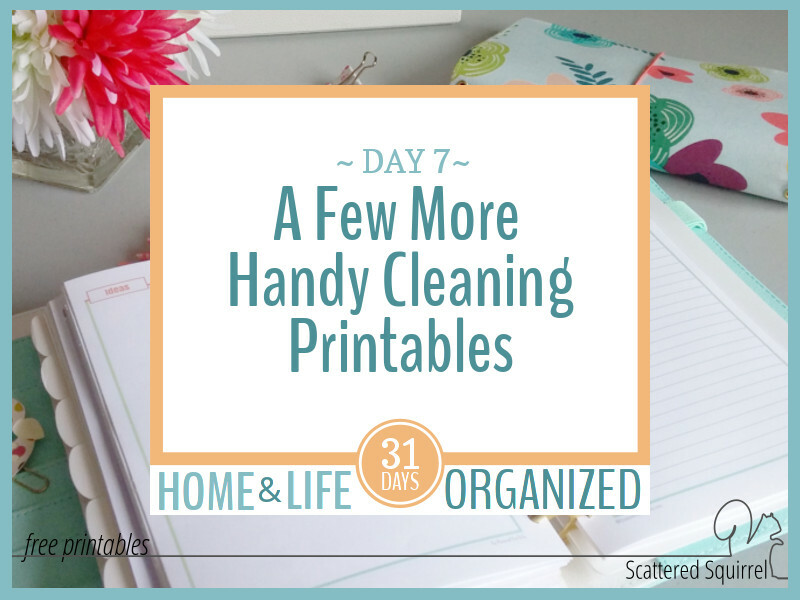 It helps me ensure our home is taken care of and allows me to plan out my home cleaning tasks so I’m not overloaded with projects. I honestly don’t know how I would manage without it. That’s not true, I know I can’t manage without it. It’s the reason I’m updating my own home management binder as we go through this series. While the seasonal home maintenance checklists and cleaning schedule are the powerhouses of this section, there are a few other pages I like to keep in this section. Though they don’t get looked at or used as often, they are just as important to me as the other ones. Ready to check them out? A number of years ago I was on the hunt for cleaners that would help combat the hard water in our old house. It was then that I was introduced to the world of homemade cleaners and the power of vinegar on hard water build up. I still make a few cleaners for my home. I will fully admit it – I’m a lazy cleaner. The more simple I can make that task the better, so my go to cleaning staples are an all purpose cleaner and a baking soda scrub. Despite this, I still like to keep a few other recipes on hand, just in case. 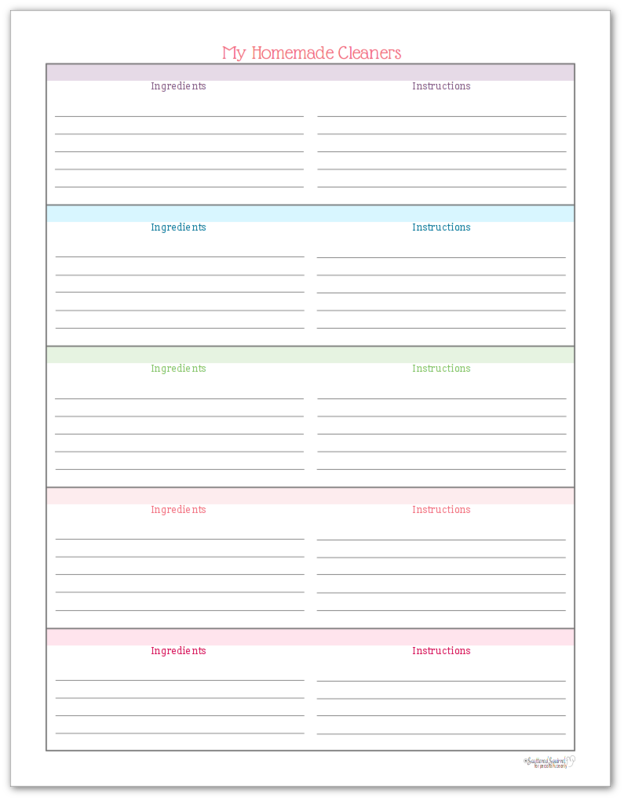 So I made up these cleaning recipe sheets to give me a place to keep them. I’ve mentioned before that I treat my home management binder as more of a reference book than a planner. Aside from helping me manage my home, I need this binder to also act as an instruction manual for our home in case something happens and someone else needs to step in to help run things. Life is unpredictable and it’s better to be prepared right? The last thing you want before heading in for surgery or something is those nagging thoughts about what you forgot to tell whoever is helping look after your home and family. That’s what my home management binder is for. It’s my peace of mind as well as my brain for our home. 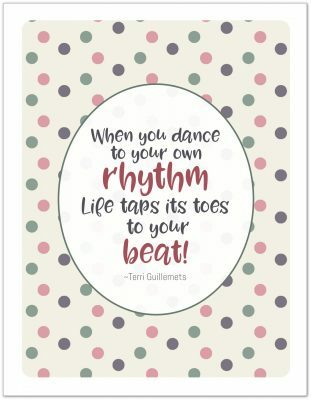 This next printable was designed with that in mind. Well, that and because I’m scatter-brained and I can’t always remember all the little details. 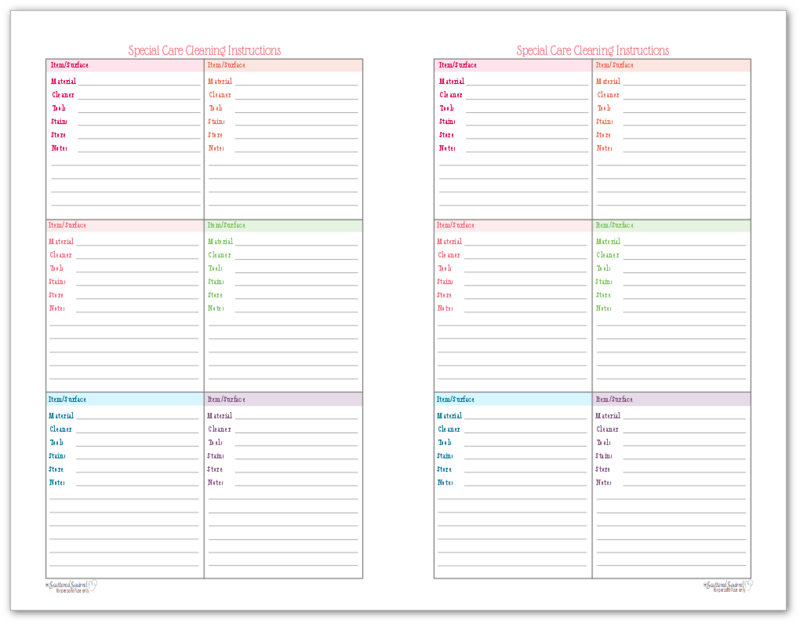 The special care instructions printable is the place where I make note of anything that is out of the ordinary care procedures for our home. It can include things like notes about how to care for different surfaces in the home. What cleaner to use on the granite counters in the kitchen, which one to use on the marble in the bathroom. What to use on the floors, or how to clean the window treatments. I try to keep our home as easy to maintain and clean as possible, but we do rent so I only have so much say. Knowing that I can quickly flip to this section to double check something is a huge help. Just like some surfaces and decorations in our homes have special care instructions, so does our laundry. I have more of these pages than I do the previous ones, but like my home, I try to keep our clothes and fabric items as easy to maintain as possible. Despite that, sometimes you just can’t get away from those items that are hand-wash only or need to be dry-cleaned. This is where I keep all of those instructions. 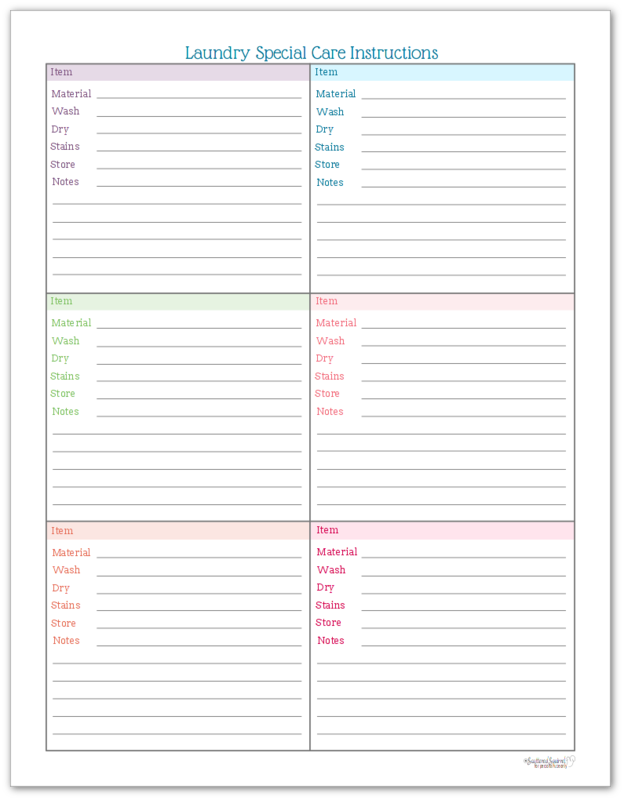 Though these cleaning printables are more reference than action, they are still integral parts of the cleaning section in my home management planner. I find it comforting to know that I can just flip to this section and everything I need to know about caring for our home is there. It makes it really easy to maintain our system and our home. I’d love to hear what you think about these. Are they helpful? 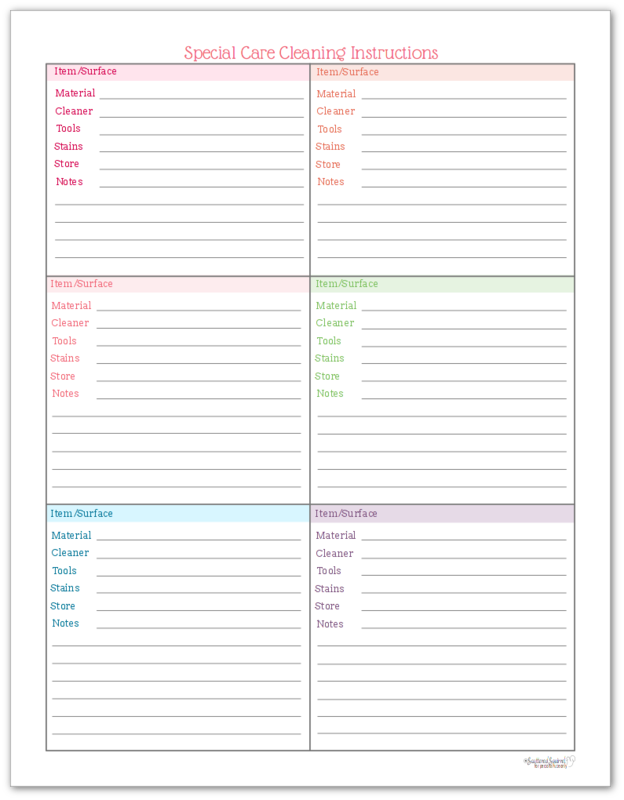 Are there other cleaning printables you’d like to see or need for your home management binder? Drop me a line in the comments below and let me know. I’ve tentatively planned the live video for Friday afternoon, so don’t forget to drop your questions in the Facebook post embedded below or in the comment section of this post. 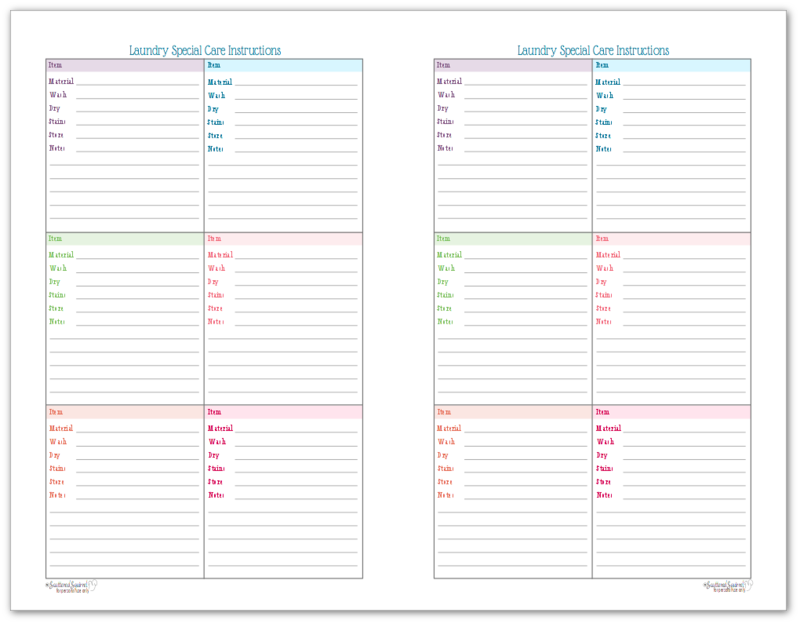 I’ll also be doing a flip through of my home management binder set up (so far) and talking a little bit about how I decide what needs to be included in it. I hope to see you there.